Runs a shelter for the homeless at the Amercian Church on Tottenham Court Road. Have a look at the Quaker Homeless Action webpage and apply for their roles. If you live locally and want to be involved they need your support. More info here. If you can help please email Anila aladwa@slpt.org.uk or call St Luke’s reception to leave a message 020 7549 8181. They are looking for volunteers to join their fantastic food drive team to help fight hunger in the UK. 8.4 million people in the UK are struggling to afford to eat. Make a difference to them by volunteering this Christmas at Tesco Metro stores in Islington. Sign up for a shift at your local store now! They are looking for a number of volunteers to sell fundraising Christmas cards at a number of pop-up shops between October and December. Local venues include St Mary’s Church on Upper Street in Islington. Volunteers are needed for three-hour shifts and training is given. Find out more and apply for volunteering on the Cards For Good Causes website here. They are currently looking for lots of energetic and enthusiastic volunteers, to join them on their fantastic fun filled Xmas Social Development Project. Volunteers will benefit in a number of ways on the project as they meet lots of like-minded people, many other volunteers are also students in London. Skills developed include time-management, working within a team, budgeting, communication, problem solving and adaptability. Give an international student studying in London a place to stay over Christmas. If you would like to invite an international student to stay for a few days at Christmas or any other time of the year, please contact HOST on 02077396292 or hosts@hostuk.org. SHP are asking volunteers to come together at Christmas and collect funds by holding a bucket for a few hours. This will make a huge difference to their year-round work and help more people move away from homelessness forever. Please contact Rebecca to find out more: fundraising@shp.org.uk or check their website. Every December volunteers gather on train concourses and tube stations across the capital to raise awareness and funds for the spinal cord injury community and their families. All volunteers will receive a free SIA branded t-shirt, first-hand experience of working within the charity sector and a guide to bucket collections with hints and tips to making the most from your shift hosting the bucket, plus more festive treats! Check their website for further info. They need volunteers to help collect food donations from customers for just three hours in their local Tesco store. It would brilliant if you could give them a hand! You can sign up for a three hour shift on any of these days. You can sign up as an individual or create a team to bring friends and family with you. As a volunteer, you will be in store handing out the FareShare ‘shopping list’ and collecting donations from customers whilst spreading some Christmas cheer. More details here. The Yes Group London Basket Brigade offers Londoners the chance to make donations all year round and also the opportunity to come together on the 23rd December every year and put those donations to good use, providing food hampers to families who struggle to put food on the table at Christmas. It’s a highlight of the year in hundreds of people’s calendar and hopefully you’ll not only donate your money to help them feed more people, but also your time to help them deliver more baskets. More information on their website. Notting Hill Genesis is a London housing provider, housing over 100,000 residents. On Christmas Day, they are organising a Christmas dinner with activities for residents who may not otherwise be able to celebrate. They are in need of volunteers who can spare a few hours to help with preparation and the party itself. Check out the opportunity here. We are looking for friendly volunteers who would like to accompany residents on a fun evening trip to see the Christmas lights. You will not have to get to and from the lights yourself, as you will be accompanying residents from their home in North London. There will be staff members present, so the volunteer role is to interact with the residents and offer a supportive arm if needed! Check out the opportunity here. Festive fundraising ideas you can do with your families, colleagues and friends and help raise vital funds for The Salvation Army this Christmas! By clicking on the tiles you will have the opportunity to download information on all of their Christmas activities. Further details here. Fancy a chance to dress up in tinsel and sleigh bells? OCA are looking for volunteers for our Christmas Bucket collections. 10th December Brixton, Regents Park, Vauxhall. The Silver Line is the UK’s only free, 24 hour, confidential helpline, specifically for vulnerable and isolated older people, open every day and night of the year. They need your help this Christmas at several London Underground stations, to collect money on our behalf on the days below. This will involve standing, being friendly and encouraging donations into our collection buckets, if you can spare a few hours or the whole day that would be amazing. Further details here. 18. NSPCC Fundraising and Events: The Lidl Big Christmas Bag Pack! Lidl are helping to fund and promote the Speak Out. Stay Safe programme with a nationwide Christmas bag pack – and now they need your help! They are asking you to spare just three hours of your time to bag pack at a selected Lidl store within the UK. Please see the role description for further information. We shall be in touch with you no later than the 30th of November with information regarding the next steps. If you have any questions, please get in touch with team Lidl at Lidl@nspcc.org.uk or 020-3961-7214. They are holding a series of collections in National Rail and Underground stations in the lead-up to Christmas. They do this to increase awareness about autism and raise vital funds to pay for their Helpline and campaigns, to enable them to transform lives, change attitudes and help create a society that works for the 700,000 autistic adults and children in the UK. They need volunteers to help at these collections, to volunteer alongside a NAS member of staff and help engage people. Further details here. They are looking for people to volunteer at their annual Christmas Carols Service. This year they want to make it even bigger and better and to do that they need your help. The evening brings people together to get into the Christmas spirit and enjoy Christmas Carols and readings from their celebrity guest readers, Amanda Mealing, Sophie Raworth, Sheila Reid and Lady Gabriella Windsor. During the evening you will be asked to help with the Prosecco pouring, canape serving, the welcome desk, taking the collection and selling raffle tickets. For further details click here. Abbeyfield are looking for Santa’s little helpers… volunteer as an individual or with family and friends. It’s time to dust off your Elf Hat and make a difference to older people. Throughout December, Abbeyfield houses and homes up and down the UK invite volunteers to share time with them. Picture festive sing-a-longs, delicious home-cooked meals and best of all, great company. Unfortunately, the sad reality is that many of their residents would otherwise have spent this time alone. To help them make this Christmas the best Christmas ever, they’re looking for a whole range of Santa’s little helpers (otherwise known as volunteers!) to support their events and, of course, join in the celebrations. Their doors are not only open to individuals, groups of families and friends are also welcome. 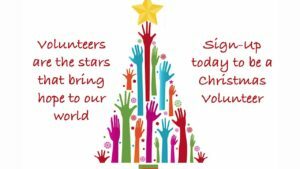 Volunteering has no age barrier and they would love to see their neighbors of all ages join in the festive fun. More information here.